Definition: A cesarean section preformed either during maternal cardiac arrest or during impending maternal cardiac arrest the primary goal of which is to increase the chance of successfully resuscitating the mother and, potentially, improving fetal survival. Overall same general approach as in non-pregnant patients. Focus must always be on resuscitating the mother, not the fetus. Use an endotracheal tube 1 size smaller. Intubation medications are the same. RSI is the preferred method of intubation for any indication in the third trimester due to the increased risk of aspiration. Supplemental O2 should be provided for any pregnant patient being resuscitated regardless of saturation. Circulation: Hypovolemia should be suspected before clinical signs of hypotension in trauma patients, as the state of hypervolemia and resulting hemodilution may mask underlying significant blood loss. Aggressive volume resuscitation is encouraged regardless of blood pressure. 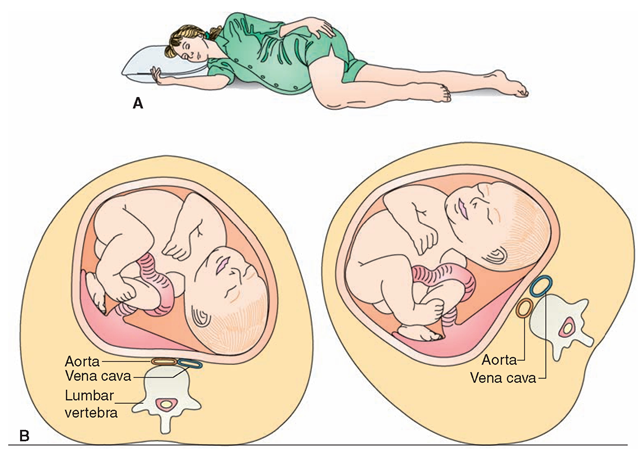 Resuscitation of the pregnant patient should include uterine displacement to relieve compression of the IVC and thus improve cardiac output and restore circulation. Perform in any patient in whom the uterus could potentially cause compression regardless of gestational age or lack of knowledge of gestational age. New model: It is more effective to manually move the uterus to the patient’s left with one or two hands during ongoing chest compressions, while patient remains flat on their back. PCS decreases uterine compression on the IVC thus increasing venous return, resulting in improved maternal cardiac filling pressure. considered viable at 24 weeks gestational age. At 24 weeks gestation, there is a 20-30% chance of extrauterine fetal survival if neonatal facilities are available. You will likely not have this information in this clinical setting. Even the best ultrasound dating criteria is subject to 1-2 weeks of uncertainty. PCS is primarily resuscitative for mother – best chance of saving the fetus is to save the mother. Counter argument to new model: before 24 weeks gestation, the fetus is small and PCS will not have significant effect on maternal hemodynamics. How long after arrest do you have to perform a PCS? Perform a PCS as soon as possible after maternal cardiac arrest. After 4 minutes of maternal arrest there is a precipitous decline in fetal neurologic outcome and survival. Despite decreased utility after 4 minutes for fetal survival, resuscitative hysterotomy will continue to hold benefits to the mother. The optimal surgical approach for a PCS is via a large vertical incision. Ramanathan S, Porges RM. Anesthetic Care of the Injured Pregnant Patient. In Capan LM, Miller SM, Turndorf H Editors, Trauma Anesthesia and Intensive Care; J.B. Lippincott Company; 1991; 599-628. Should you continue CPR after the C-Section? Yes. The C-section will hopefully improve venous return and increase the efficacy of your CPR. Is it requires any type of anaesthesia? Patients requiring peri-mortem c-section are typically in extremis and likely do not need much if anything in the way of anesthesia. Obviously, I’d be very cautious about any systemic medications that may drop BP.